An indoor pool environment has greater requirements than a commercial building because of the higher humidity. If not controlled, the corrosive condensate that forms will destroy structural components, sometimes with disastrous effects. Further, the high humidity is uncomfortable for occupants and can cause chronic respiratory condition (i.e. lifeguard lung). To manage humidity, dehumidifiers specifically designed for the pool environment are used to control the excess moisture. But unlike commercial heating, ventilation, and air conditioning (HVAC) equipment, dehumidifiers require more energy to properly operate. Today’s higher cost of energy, and the desire to improve sustainability, has created the need for more efficient technology. One way to achieve this is by using air-side economizers. Economizing can also be used successfully for indoor pool environments where temperature set points are typically 29 C (84 F) with relative humidity (RH) at 60 per cent. This set point allows outside air (OA) to be used more frequently and over a wider range of outside air temperatures as compared to office applications. Outside air can also be used for dehumidification and to some degree heating as well. 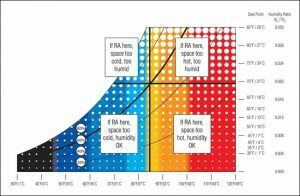 The control technology plays a key role in analyzing and comparing outside air temperature and humidity with return air (RA) temperature and humidity and deciding which mode offers the lowest cost of operation to meet set point conditions. When considering a high-end dehumidifier for an indoor pool make sure to include all the necessary hardware and firmware for full economizer operation upon delivery, no additional investment is required to take advantage of these extra features. Many pool dehumidification equipment manufacturers offer economizers as standard or optional equipment, but the majority are for cooling only. Often referred to as ‘free cooling,’ an air-side economizer significantly reduces the energy required for cooling commercial buildings by limiting compressor operation. It will exhaust equal parts of warm, moist return air with outside air as exterior conditions permit. It is also effective in improving indoor air quality (IAQ) through greater quantities of ventilation brought into the building. Because the energy savings are substantial, the International Energy Conservation Code (IECC) requires economizers in any system larger than 54,000 BTU/hr. This excludes extremely hot, humid, and cold climate zones where economizers are less effective. In their basic form, air-side economizers comprise dampers for the outside air and return air which work in unison to control air flow. When outside air conditions are cool and dry enough, the mechanical cooling is shut off and the system uses outside air to cool and dehumidify the structure. Air-side economizers come in various arrangements, including temperature-based or enthalpy-based. Economizers operate behind the scenes, and it is difficult to know when they are functioning without expensive monitoring instrumentation. These systems have typically been more cost-effective for larger buildings, but improvements in mechanical equipment and controls are creating new opportunities in smaller applications. However, economizing is less effective in climates having substantially higher temperatures and moisture levels. Outside air has gone full circle, and has two practical functions in a natatorium. It removes excess moisture for a more comfortable environment and it improves the IAQ through ventilation, ridding the space of air quality problems like chloramines formed through chlorine off-gassing, and carbon dioxide (CO2). Before the advent of affordable mechanical dehumidification, outside air was used exclusively to condition the space. The introduction of refrigeration technology allowed better control of temperature and humidity, but at a cost. In addition, dehumidification equipment and control strategies did not often meet expectations, but many equipment manufacturers still relied on costly direct expansion (DX) systems as their primary means of moisture removal. The high cost of energy to heat outside air also deterred its use other than what was required by code. Today’s more efficient equipment can once again use outside air without the penalty of higher cost. While most economizers operate in a similar fashion, those used with indoor pool dehumidifiers have unique requirements. 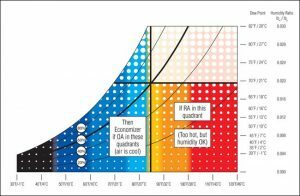 Many basic economizers are not adequately equipped to balance air temperature over time. When the controller senses the outside air is right for cooling, 100 per cent of the return air is exhausted and replaced by an equal amount of outside air. The result can be rapid economizer cooling followed by reheating once the economizer cycle ends and the compressors restart. Some of today’s technologically advanced dehumidifiers have taken economizers to the next level. Rather than full economizing or full direct-expansion dehumidification, these units control both outdoor and return air using a modulating mixing box to regulate cooling and dehumidification. Both outdoor air and return air can be gradually mixed in varying quantities for optimum occupant conditions. In this case, only the required amount of outdoor air is used to provide the set point conditions at the lowest cost. By using this method, compressor operation is minimized without sacrificing space conditions. This can also represent lower operating costs over conventional economizers. 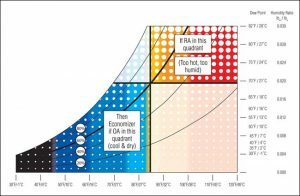 Further, IAQ is improved because more outside air is used, and compressor wear is lessoned as the system operates less frequently. Dehumidifiers using economizer strategies such as this require special design features to operate efficiently. Mixing box, air path, and fan design must be optimized to maximize cooling and dehumidification. High quality sensors also need to be strategically located to carefully monitor temperatures and humidity, while the control system requires specifically designed firmware and software to ensure precise operation. Figure 1: Set point. Most conventional dehumidifiers control to dry bulb (DB) and relative humidity (RH) at or near 29 C (84 F) DB and 60 per cent RH set point. Other control to dew point (DP) and dry bulb, e.g. 29 C (84 F) DB and 21 C (70 F) DP set point. • Upper right quadrant: Space is too hot and too humid. • Bottom right quadrant: Space is too hot, but the humidity is satisfactory. • Upper left quadrant: Space is too cold and too humid. • Bottom left quadrant: Space is too cold, but the humidity is satisfactory. 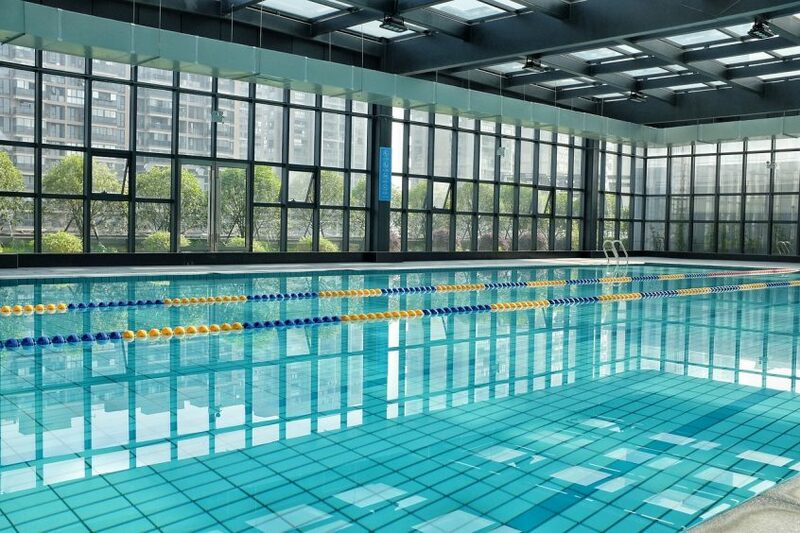 The indoor pool environment can be highly corrosive, resulting in damage or destruction of critical dehumidifier components such as sensors, dampers, and solenoids. Early indoor pool air-side economizers did not always share the same high regard as conventional HVAC equipment and were destined for failure due to poor design or improper construction. Sensors are a good example of this—especially in the indoor pool environment. Quite often, sensors were rarely, if at all, calibrated during their lifespan, adding to the control problem. Sensors were often placed in the wrong location, and in some cases the wrong type was used, which further limited economizer performance. Enthalpy sensors, which measure total heat content, cannot differentiate the latent (wet) from the sensible (dry) amount. Knowing the exact latent heat content is crucial since dehumidification is the primary function in a high-moisture indoor pool environment. Other economizer design flaws include improperly sized dampers which restrict or limit airflow. Pressurization is also critical. Natatoriums, for instance, require a negative pressure to minimize pool odours and humidity from infiltrating adjacent areas in an aquatic facility (e.g. offices, classrooms, etc.). On the other hand, over pressurization will hamper airflow resulting in poor economizer performance. Some studies have shown by enhancing the operation of an economizer system it can be one of the most cost-effective measures in optimizing energy performance while also assuring a quick return on investment (ROI). Components like sensors have greatly improved, and using industrial-grade sensors can provide even greater accuracy. Direct-digital controls also improve the performance of an air-side economizer. Today’s developments in hardware and firmware allow precise monitoring and control of outside air. An economizer is an excellent choice for an indoor pool environment for other reasons as well. Since the space set point temperature is typically operated at 29 C (84 F), outside air can be used more frequently and over a wider range of outdoor temperatures than in office applications. Outside air can also be used for dehumidification and to some degree heating as well. Digital control technology plays a key role in analyzing and comparing outside air temperature and humidity with return air temperature and humidity and deciding which mode offers the lowest cost of operation to meet the set point conditions. A prudent indoor pool dehumidification strategy is to use an economizer as the first stage of control and not turn on the compressor system. Since the fans are already running, it makes more sense to simply open the dampers to maintain conditions. To better understand the pool room environment, the psychrometric chart can be divided by the indoor pool room set points of 29 C (84 F) and 60 per cent relative humidity, the most frequently used setting for indoor pools. A control system can use these two set points to divide the psychrometric chart into quadrants along the vertical 29 C (84 F) dry bulb axis line and the horizontal absolute humidity line of 21 C (70 F), dew point at 29 C (84 F) and 60 per cent relative humidity. The goal is to have the controller compare the condition of the return air to the set point quadrants on the psychrometric chart. The controls will determine if the space requires heating, cooling, and/or dehumidification depending on which quadrant the return air dry bulb and dew point temperatures are. In this mode, the return air condition is in the bottom right quadrant, meaning the air is too hot, but humidity is acceptable. If the outside air is in either the upper left or lower left quadrants (outside air is cooler than return air), then the controller should slowly open the outside and exhaust air dampers and close the recirculation damper to introduce up to 100 per cent cool outside air into the indoor pool space. In cooling and dehumidification economizer mode, the return air condition is in the upper right quadrant indicating the air is too hot and too humid. If the outside air is in the lower left quadrant (outside air is cooler and dryer than return air), then the controller should slowly open the outside and exhaust air dampers and close the recirculation damper to introduce up to100 per cent cool outside air into the space. To use the heating economizer, the return air condition is in the bottom left quadrant where the return air is too cold and humidity is acceptable. If the outside air is in either the upper right or lower right quadrants, where the outside air is warmer than return air, then the controller should slowly modulate open the outside and exhaust air dampers and modulate closed the recirculation damper to introduce up to 100 per cent warm outside air into the space. To use the heating and dehumidifying economizer, the return air condition is in the upper left quadrant where it is too cold and too humid. 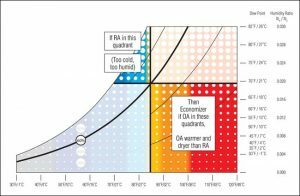 If the outside air is in the lower right quadrant it is warmer and dryer than return air. Under these conditions, the controller should slowly modulate open the outside and exhaust air dampers and modulate closed the recirculation damper to introduce up to 100 per cent warm outside air into the space. The controller should check if the outside air is cooler than the return air, but is not quite as concerned if the humidity is somewhat higher. The economizer function can also be used in other ways to lower operating costs. By using an economizer in conjunction with the heat recovery mode of the dehumidification system, heating costs can be further reduced. Indoor pools typically have high heating demands, and the heat pump operation of the dehumidification stage can satisfy much of these requirements. When the refrigeration loop is running in the heat recovery mode, and the space is calling for heat, the air passing over the evaporator is being cooled to saturation. The sophisticated direct digital control system measures and compares the condition of air leaving the evaporator with the outside air temperature and humidity. If the outside air is warmer and dryer than the exhausted evaporator air, the control system will automatically close the recirculation damper and fully open the exhaust and outside air dampers. All of the cool, saturated air coming off the evaporator coil is exhausted and replaced with 100 per cent of the dryer, warmer outside air. The outside air is then passed over the heat recovery hot gas reheat condenser coil where this supply air is reheated with ‘free’ sensible and latent return air heat, which was recovered in the evaporator prior to being exhausted. Figure 6: Smart economizing. 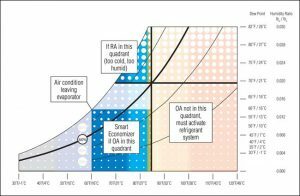 In the smart economizing mode, the system is in the heat recovery mode and the outdoor air (OA) is warmer and dryer than the return air (RA) leaving the evaporator. Air exhausted by the evaporator is replaced with 100 per cent outdoor air. By using this system, a significant amount of energy is saved, which can also be used for pool water heating whenever the space temperature is satisfied. Even though the compressors are operating, these economizers can save between $2000 to $4000 per year in heating energy that standard economizer mixing boxes cannot. This economizing method is only possible if the pool dehumidifier has a mixing box, the exhaust air damper is located downstream of the evaporator and upstream of the hot gas reheat condenser coil, and is equipped with control software that knows what action to take when the proper energy-saving conditions occur. Beyond humidity and temperature, a major factor in IAQ is airborne pollution that off-gasses from the pool and wet deck. The concept of ‘solution by dilution’ has prevailed as the best practice for handling natatorium IAQ. There are dozens of airborne disinfection byproducts, generally referred to as chloramines, and studies have proven they (along with other pollutants) are not only harmful to bather health, but are also corrosive. Within the last five years, the paradigm has shifted to a targeted intelligent ventilation technique called evacuator source capture. While introducing additional outside air serves many benefits, it can also be costly when brought in excessively to dilute chloramines alone. This is important when outside conditions limit the use of an economizer and outside air. Technology such as evacuator source capture equipment provides effective exhaust of the worst air in the room, without the need for additional outside air. Effective capture of airborne chloramines can ease the burden on the dehumidification system because it can reduce—if not prevent—the recirculation of corrosive air through the mechanical system. This can extend the life of the building and equipment, while also ensuring the supply air to the natatorium is clean and free of harmful chloramines. It is important to note the environmental control system (pool dehumidifier) exhaust air function be synchronized with the evacuator. As the evacuator’s exhaust air increases or decreases, the dehumidifier changes simultaneously in the opposite direction to balance outdoor air requirements. Economizer systems are often neglected and, over time, can degrade to the point they do not operate correctly, resulting in wasted energy. Therefore, periodic maintenance ensures these systems run efficiently. Economizers, regardless if installed on a pool dehumidifier or conventional HVAC unit, will perform more efficiently if properly inspected and calibrated. Starting with dampers, be sure they are not seizing, a common problem with corrosive environments like indoor pools and saltwater locations. Further, be sure actuators are adjusted for full closure and linkages are not binding. Improperly positioned dampers can significantly reduce the efficiency of the system due to increased mechanical cooling or heating load because the system is operating with incorrect outside air, return air, and exhaust airflows. Finally, inspect the unit’s blade and seals for leaks, which can account for as much as 10 per cent of rated damper airflow. Keep the return air and outside air sensors calibrated as they are critical in determining the economizer operating mode. Are indoor pool economizers cost effective? The true test of an economizer is its ability to track system operation over a meaningful time period. This way, modelling data can be used to accurately predict energy savings. Accurate representation requires hourly analysis of internal loads along with outside environmental conditions. Instantaneous cooling, heating and/or dehumidification load for each hour along with the simultaneous external conditions must be known. In summary, air-side economizers are a good investment for reducing operating costs. 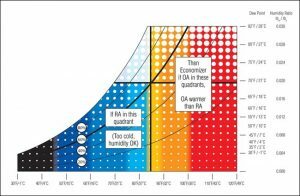 Before purchasing new dehumidification equipment, be sure the economizer system will maximize energy savings over a wide range of operating conditions. This article was written by Tom Scozzari and originally appeared on Pool & Spa Marketing [link].